Selfie at the tea plantation we visited. We’re in the middle of a tea plantation right now. One thousand miles west of Lisbon, Portugal-right there-are these islands known as the Azores. They’re like the Hawaii of the Atlantic. We’re on the biggest one, San Miguel. Here we are in our rental car. Front to Back: Me, Tynan, Ben, Theresa. Right here is where our cruise ship docked. First step, we had to rent a car, not pictured. That’s Theresa. It’s pronounced Azores, but we didn’t really know. We’re driving now and driving and then I’m walking through a tea plantation. This is the largest and maybe only tea plantation. We are going in there. 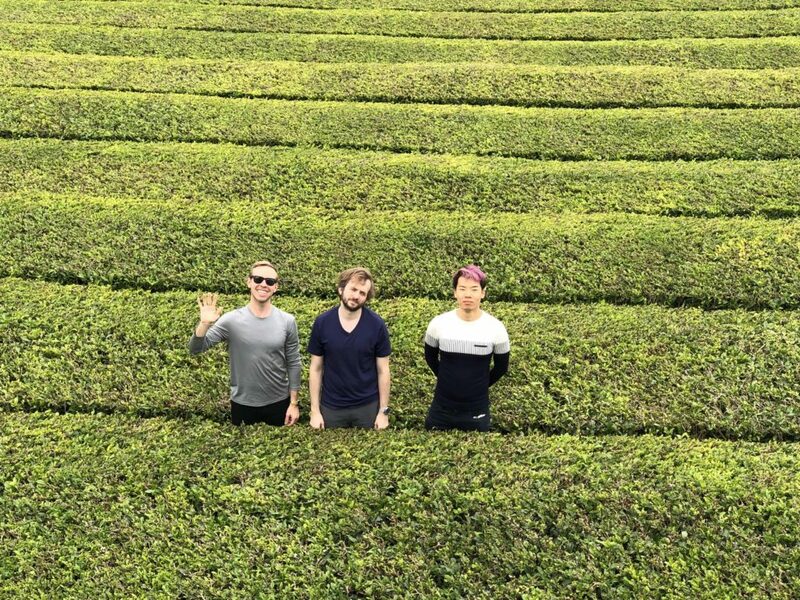 Me, Tynan, Ben at the largest tea plantation in the Azores. We are inside the tea factory now where you can see the machinery that’s used during harvest season. We even got to touch the tea, oh wait….There’s our squad. Left to right…Theresa, Me, Ben, Tynan. The tea plantation and factory were really awesome. Greetings! We’re at the tea factory and we’re going to get some tea right now. Mmmm delicious. Before we left we thought it would be funny to film a video of all us back here. Here is our camerawoman, Theresa. Hey Theresa. Next stop on our journey, to go to a waterfall. Thanks, Theresa for these cool photos. With our trusty Google maps we headed off for a beautiful drive. Hey Ben, where we at? Wow, we just arrived at a tropical rainforest! Welcome to the Parque Natural Da Ribeira Dos Caldeiroes Natural Park. Beautiful view of Parque Natural Da Ribeira Dos Caldeiroes Natural Park. Let’s go see some nature. What’s up squad! Speaking of nature here’s-wait a second-Ben’s tattoo look’s just like this plant! Tynan, jump up. Next, we came to the waterfall as we’re hiking around the National Park. We are at the bottom of the hiking path. I got my bathing suit and my goggles. We’re going fish hunting. There’s a fish! It is so cold. Ben also got in the water, but sort of unwillingly. That was actually really awesome. That was awesome. Not pictured: Really cold waterfall we went swimming at. We’re hiking back now. We hiked up this incredibly steep and slippery slope through a beautiful vista and then we saw all these cows on the drive back. And now we are back on the ship. I took a shower and I feel all nice now. Thank you for watching. This is the end of the video. Hey, do me a favor. If you like this video, will you press the like button? It encourages me to make more of these. Thank you for watching. See you later, bye!